In 2013 my friend Mindi and I started a monthly blog link up called Catch the Moment which challenged fellow bloggers, and ourselves, to pick up our cameras more to catch the moments we normally would have missed. Those everyday moments that we tend to overlook and those details about our kids that we don’t want to forget. Hand dimples, chubby toes, capturing milestones, and so much more! At the end of the year I connected with Stephanie and we discovered we both wanted to do a Project 365, but figured we needed a support group to encourage and inspire us for this photo-a-day for a year project. I then got Mindi on board and we morphed into Catch the Moment 365. Within the first week of this project we had almost 100 members join and link up, the response was overwhelming – but in a very exciting way!! We encourage you to join us – you can start your Project 365 at any point in the year, the purpose is just to take a photo-a-day for 365 days in a row. We’re here to improve our photography, challenge ourselves, meet new friends, enhance our love of photography, inspire & encourage each other, and catch the moments we normally wouldn’t. Here are our guidelines if you would like to participate, but we are a very flexible group, so feel free to bend the guidelines as it suits your posting needs. Link up the blog post including your photos taken the previous week (Wednesday – Tuesday). Please link the direct blog post, not your homepage and select your favorite from the week as your thumbnail! I know a few of you are posting a photo a day as an individual blog post, so pick your favorite or link to the ‘category’ or ‘tag’ you are doing your 365 under. 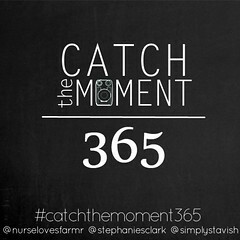 Use our Catch the Moment 365 button or link back to one of your three hosts (Nurse Loves Farmer, Behind the Camera and Dreaming or Simply Stavish) somewhere within the post. I know a lot of our participants have the button on their sidebar which is greatly appreciated, but it needs to be in every post, it’s just a kind gesture of acknowledgement to your hosts for the weekly link up which is a lot of work! Most importantly, have fun, and support each other! Don’t forget to visit the other participants, and leave some comment love! The more you participate the more feedback and encouragement you will get! You can additionally choose a personal hashtag that will link your own photos from each day and post throughout the year (ie: #catchthemoment365BTCAD, #catchthemoment365stavish, etc). Here is our button linking to my site specifically, if you know basic HTML it’s very easy to resize it. Please put this on your blog posts and even on your sidebar if you’d like! You can find more buttons and sizes here if you would like.